Urgent message: Familiarity with the schedule for immunization against pertussis, as well as expertise in diagnosing and prescribing treatment, should be within the urgent care provider’s capabilities—as should the ability to distinguish which patients require transfer to a higher-acuity setting. Childhood immunity to pertussis is conferred through the administration of the acellular pertussis vaccination, which comes in two forms: DTaP and Tdap. Children are immunized with DTaP at 2 months, 4 months, 6 months, and 15-18 months of age. A booster dose of DTaP is given at 4-6 years old, and a second booster dose of Tdap is given at 11-12 years of age.2 The risk of acquiring pertussis increases six-fold after the fifth year following the initial 5-dose DTaP regimen.3,4 Similarly, vaccine effectiveness can wane to approximately 34% in the 2-4 years following a dose of Tdap.5 The greatest risk of obtaining pertussis occurs in young infants and children who have not obtained their full series of DTaP, as well as older children with waning immunity. Question 1: What is the likelihood that the patient has pertussis? The likelihood of pertussis also increases with known exposures to pertussis. Clinicians should therefore not only discuss the symptoms of the patient, but also ask about other members of the household who may have symptoms concerning for pertussis. Question 2: Is the patient at risk for having pertussis-related complications? Complications include apnea, bradycardia, pneumonia, and death. There are no existing clinical decision rules to assess risk; however, studies point to certain groups who are at highest risk for severe complications as seen here and in Table 1. Prematurity: Premature infants have demonstrated increased risk for mortality, with 51% of fatal infant cases occurring in infants born at <37 weeks and 29% occurring in infants born at <35 weeks gestational age. It is unclear what corrected gestational age mitigates this risk. Question 3: Are the close household contacts at risk? The clinician should query the family regarding ages of any household contacts and pregnancy status, and whether household members have contact with infants/children, pregnant women, or elderly persons. Finally, the clinician should ask about the immunization status of the household members and whether they currently have pertussis-like symptoms. The clinician’s exam should focus primarily on the pulmonary exam, specifically focusing on evidence of respiratory distress, hypoxia, or focality on auscultation. The clinician should also pay special note to the patient’s hydration status, as infants are prone to have feeding difficulties. 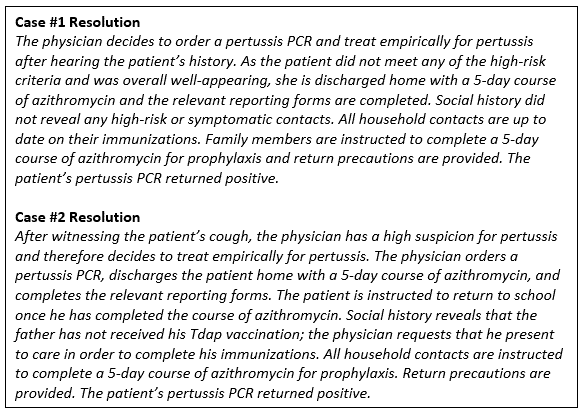 The management questions for the pediatric patient with suspected pertussis are outlined in Table 2 and summarized below. 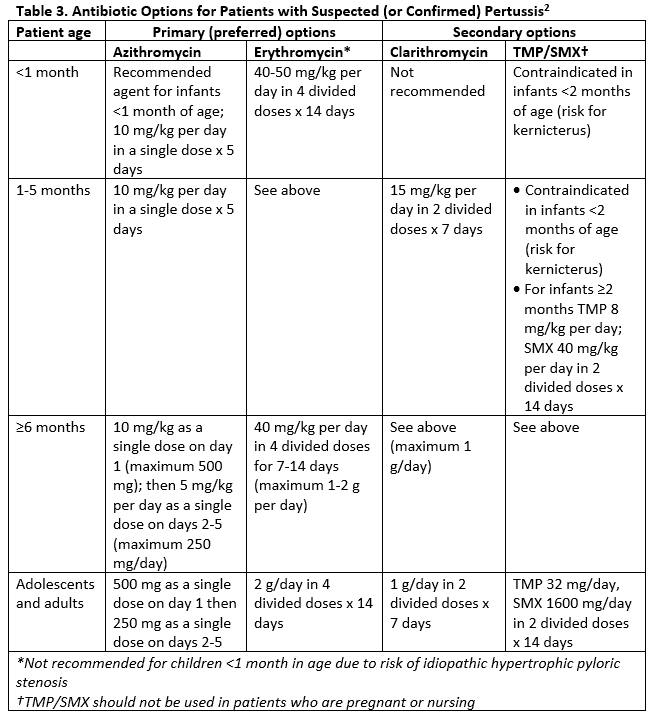 Regardless of age, antibiotic therapy should be initiated prior to or in the absence of testing for any child who has a clinical picture that is strongly suggestive of pertussis, or for a child at high risk of pertussis-related complications. Early antimicrobial therapy may attenuate the severity of the disease, especially if it is administered during the catarrhal phase when live bacterium are still present,1,6 and will help curtail spread of disease. As the disease is toxin-mediated, treatment initiation later in the disease may have little impact on symptoms, but is still worthwhile as it decreases the risk of transmission. The decision of whether to admit will be based on the clinical exam and the patient’s overall risk for developing severe pertussis. Symptoms such as respiratory distress, hypoxemia, apnea, cyanosis, or dehydration would suggest a need for hospitalization or prolonged observation. Infants who require admission for management of apnea or bradycardia should be admitted to an institution with pediatric expertise, and preferably a pediatric intensive care unit. High risk factors for pertussis complications include infants less than 4-months-old, infants with history of premature birth, and immunocompromised patients. Clinicians should complete the appropriate reporting forms to their state department of public health when initiating treatment for pertussis. Centers for Disease Control and Prevention. Pertussis (whooping cough). Available at: https://www.cdc.gov/pertussis/index.html. Accessed March 14, 2019. Klein NP, Bartlett J, Rowhani-R A, et al. Waning protection after fifth dose of acellular pertussis vaccine in children. N Engl J Med. 2012;367(11):1012-1019. Tartof SY, Lewis M, Kenyon C, et al. Waning immunity to pertussis following 5 doses of DTaP. Pediatrics. 2013;131(4):e1047-1052. Acosta AM, DeBolt C, Tasslimi A, et al. Tdap vaccine effectiveness in adolescents during the 2012 Washington State pertussis epidemic. Pediatrics. 2015;135(6):981-989. American Academy of Pediatrics. 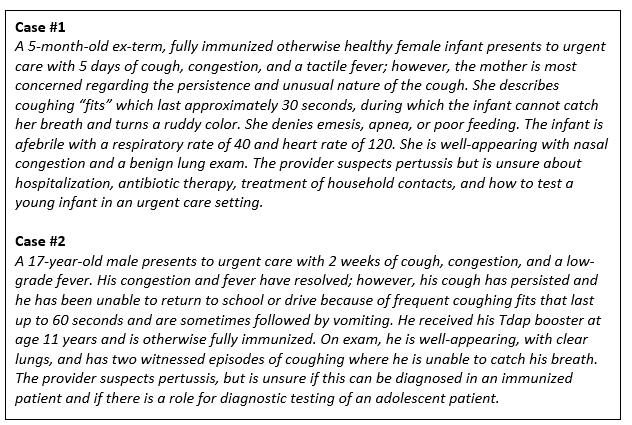 Pertussis (Whooping Cough). In: Pickering LK, Baker CJ, Kimberlin DW, Long SS, eds. Red Book 2015. Report of the Committee on Infectious Diseases. Elk Grove Village, IL. American Acemy of Pediatrics; 2015:608-621. Heininger U, Klich K, Stehr K, Cherry JD. Clinical findings in Bordetella pertussis infections: results of a prospective multicenter surveillance study. Pediatrics. 1997;100(6):e10. Briand V, Bonmarin I, Lévy-Bruhl D. Study of the risk factors for severe pertussis based on hospital surveillance data. Vaccine. 2007;25(41):7224-7232. Vitek CR, Pascual FB, Baughman AL, Murphy TV. Increase in deaths from pertussis among young infants in the United States in the 1990s. Pediatr Infect Dis J. 2003;22(7):628-634. Cortese MM, Baughman AL, Zhang R, et al. Pertussis hospitalizations among infants in the United States, 1993 to 2004. Pediatrics. 2008;121(3):484-492. Tiwari TS, Baughman AL, Clark TA. First pertussis vaccine dose and prevention of infant mortality. Pediatrics. 2015;135(6):990-999. U.S. Food & Drug Administration. FDA drug safety communication: FDA required labeling changes for prescription opioid cough and cold medicines to limit their use to adults 18 years and older. January 11, 2018. Available at: https://www.fda.gov/Drugs/DrugSafety/ucm590435.htm. Accessed March 14, 2019. Ellen Laves, MD is Assistant Professor in Pediatrics at the University of California, San Francisco. The author has no relevant financial relationships with any commercial interests. ← What Exactly Are Whistleblower Lawsuits—and How Can You Protect Your Urgent Care Operation?